Have you ever wanted to know more about other cultures? What if I told you, that it‘s possible to visit four countries and get to know about their cultures in one evening? This is what ESN VMU together with “Kauno įgulos karininkų ramovė” did on 4th of March. The event „Cultures up Close” invited all Kaunas citizens and guests to participate in a wonderful evening where the journey through four different countries and cultures began. Who can represent the country and culture better than a native student? Therefore, ESN VMU gathered students from Azerbaijan, Georgia, Latvia and South Korea so that they can represent their countries to Kaunas citizens and other guests. Major Donatas Mazurkevičius’ opening speech highlighted the importance of international relations. He introduced all the participating countries and their relationship with Lithuania. Major also felt sorry that students from Ukraine couldn‘t participate in this evening, due to the situation in the country where people fight for their independence. However, he greeted all the foreign students and the evening began. Right after the opening words the president of ESN VMU Roberta greeted all the participants and Kaunas citizens. Then she passed the word to ESN VMU public relations coordinator Dominykas, who presented ESN VMU organization to all Kaunas citizens. The time has come to present cultures and the first ones who took the stage were students from Azerbaijan. They showed the beauty of the country by comparing it to Azerbaijan in Soviet Union times and to Azerbaijan nowadays. It was significant, because a lot of guests have visited Azerbaijan back in the day, but even for those who have never been there it was interesting to see how the country changed during the years. Students from Georgia stepped on the stage next. They not only showed a beautiful landscape of Georgia, but also taught all of us a lot about Georgian culture. They showed us videos of folk dances in traditional clothes, celebrations and the ways of partying with family and friends, songs and lots of more. Also, all guests of „Cultures up Close” learned about Georgian hospitality and of course – Georgian wine. During this live presentation you could really feel the atmosphere of Georgia. From the distant land of Georgia we went to our sister Latvia. Three Latvian students spoke in fluent Lithuanian. Girls from Latvia convinced everyone that Latvian and Lithuanian languages are extremely different by showing examples from both languages, when pronunciation is similar but the meaning is different. Audience was surprised when after singing traditional Latvian song they started to sing in Lithuanian. They finished their presentation with the slides capturing the moments of how they see Kaunas and how they spend their time here. It was obvious that Latvian girls love Kaunas and Lithuania. The last but not least who took the stage was student from South Korea. She showed up dressed in traditional Korean clothes. The main idea of her presentation was to show the common points of Lithuania and South Korea. Shortly afterwards the presenter was joined by her friends wearing the same gowns. They taught the audience how to bow politely in front of strangers in South Korea. Moreover, girls prepared traditional South Korean dishes and everyone could have a taste of this exotic land. After all presentations the Major gave gifts to all of foreign students who represented their countries. Together with the president of ESN VMU he closed the event once more emphasizing the value of friendship amongst countries. „Cultures up Close” was not the first and definitely not the last event organized by ESN VMU together with “Kauno įgulos karininkų ramovė”. 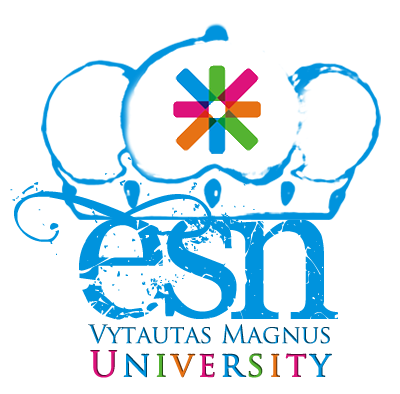 Events like this create strong relationships between countries and that‘s what ESN VMU is up for.